Yeah, I got one of those too. My Heritage Manufacturing Rough Rider came with two cylinders, one for .22lr and the other for .22 Magnum. Though, I confess, I haven’t used the .22 Magnum cylinder yet and have only run .22lr through the pistol. 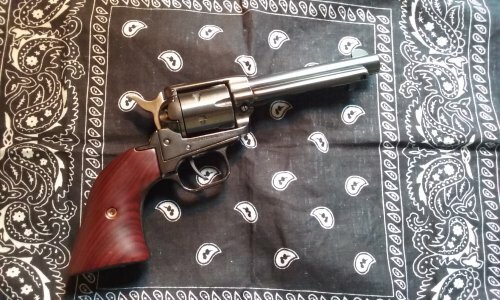 My Rough Rider is my primary target pistol. 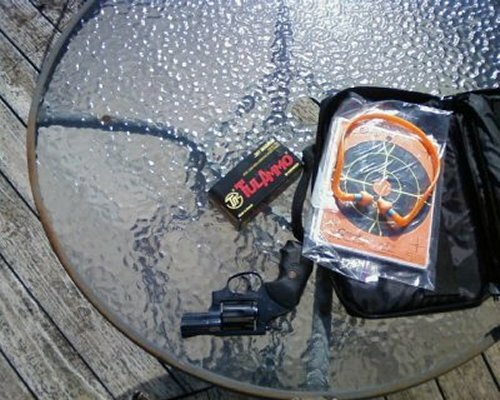 I bought it because I wanted to learn to shoot like Wyatt Earp and Billy the Kid. 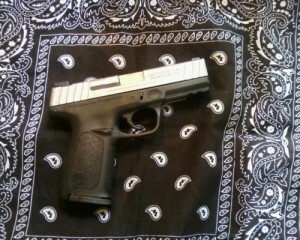 I might get another one eventually, so I can do two pistol shootings. I think that would give me equal practice with both hands and it would be fun. Heritage Manufacturing has several different versions of the Rough Rider. 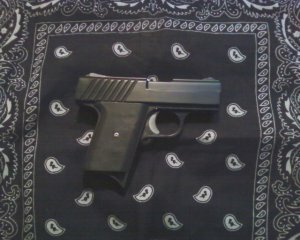 They come in different calibers, colors and grips. You can also buy different grips, to replace the ones you have, if you want something more fancy. I have an eye on a couple different grips. I also like the holsters they have. It’s all available on the Heritage Manufacturing website. My Rough Rider does everything I expect it to do. It must shoot straight, because I can hit the target with it. What’s a good holster for the Cobra Denali? My October 2015 entry about the Cobra Denali is one of my most viewed entries. I imagine people land on it because they’re thinking about buying a Cobra Denali and they want information about it. It occurred to me that some people might also be looking for a holster for their Denali. I don’t think there are any holsters that were made specially for the Denali and it might be tough finding a holster that works with it. The holster I use is an Uncle Mike’s size 1 IWB. 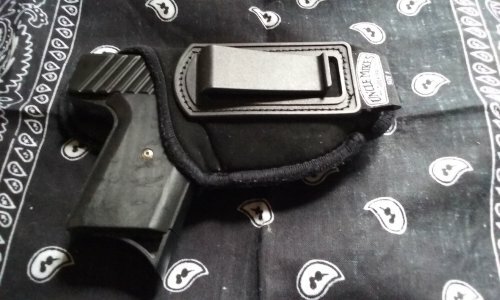 This holster is pretty slim and it’s comfortable in my waistband. 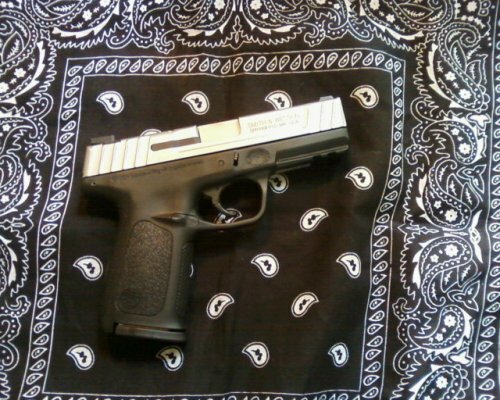 It also works good as a pocket holster, which I sometimes use it as. 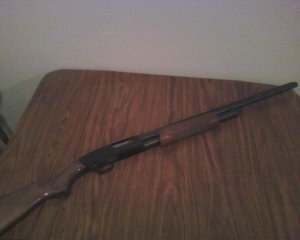 You can’t go wrong with a Mossberg 500 pump shotgun. I bought this baby eighteen years ago and it still runs like new. Mossberg 500s are made in different sizes and for different purposes. There are the long ones, which are meant for hunting. There are the short ones, which are meant for defense. Some have shoulder stocks with pistol grips and some just have pistol grips with no shoulder stock. Mine is a long hunting shotgun. It is my primary hunting gun. Sometimes I hunt with an old single shot 20 gauge that I got for Christmas when I was thirteen, but usually I use the Mossberg 500 because I prefer 12 gauge power. I feel that a 12 gauge is more liable to nail a deer than a 20 gauge. Mossberg 500s are affordable shotguns. I bought mine brand new and it cost around $250.00. Not a bad price for a gun that stays reliable for a long time. My dad and I went to the antique gun show in Lapeer a few days ago. The place was packed to the gills and it wasn’t easy moving around the building. I’m not a fan of crowds, but I did appreciate all the items that were on display. They were fascinating. I might have spent more time looking at each item, but there were a lot of other people wanting a look too and I didn’t want to hold them up. This was a gun show, so most of the items were, in fact, guns. A lot of muskets and single shot pistols were on display. I also saw a couple of Spencer rifles and several black powder revolvers. Most of the guns looked old. I think several were from the Civil War era, but others might have dated back to the American Revolution. And some of the guns were copies of the older guns and probably only a few years old. I especially liked the single shot pistols. If I had the money, I would have bought all of them. There was also a very nice western style hat that I really wanted, but I didn’t have enough money for anything in there. The hat, I think, was pretty old, probably about the same age as the Johnny Reb hat and the Billy Yank hat that were next to it. We had planned to go to another gun show that was in Flint after we got out of the show in Lapeer, but the roads were pretty bad, so we decided to skip that one and went to the grocery store instead.